The state flag of Idaho features the state seal designed by Miss Emma Edwards in 1891. The star that appears in the lower part of the golden rim indicates that Idaho was a new state, while the minerand a woman in the state seal denotes the mineral wealth of the state and symbols of equality, liberty and justice respectively. Idaho was one of the first states to grant women the right to vote in 1896.The words “State of Idaho” in gold letters on a red band appear below the seal. The Idaho Seal depicts a miner and a woman as symbols of equality, liberty and justice. Our Idaho State Flags are available in a variety of sizes of 3’x5’,4’x6’, 5’x8’ 6’x10’ and 8’ x12’ and fabrics including nylon and polyester. Made with precision and beauty, these flags will put your Idaho pride in style. Made in USA, these flag enjoy 6 months guarantee on construction. 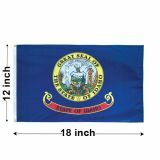 Shop from our complete line of Idaho Flags right away and avail the best prices, quick shipping and much more! 100% customer satisfaction guaranteed! Idaho flags from Tuff Flags are perfect choices to celebrate the fun, character and the unique identity of Idaho. These single face reverse flags that show correctly on both sides feature UV resistant Dupont inks that will retain its colorfastness for a long time. Choose from nylon or Polyester for outdoor use. Nylon is lightweight, durable and flies elegantly in the slightest breeze. Polyester on the other hand is extra strong and durable, which makes it a good choice as a daily use flag for homes or business organizations in high wind areas. 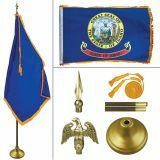 Indoor Idaho state flags are offered in plain and gold fringe model. These commercial grade flags finished with pole hem and leather tab can be mounted on our aluminium, oak or adjustable poles. 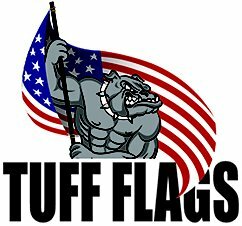 These are well suited for indoor flag display and as parade flags. Whether as keepsakes, gifts or for flag display, our Idaho flags will ensure more value for your money. Browse our selection of Idaho Flags and pick up a model that matches your needs. 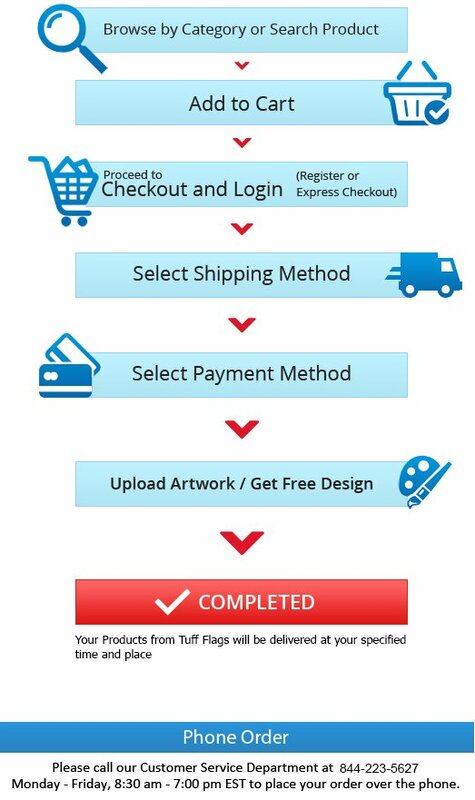 Should you need any suggestions, call us at our toll free number (888) 287-3524 or email us at customercare@tuffflags.com and we can help you.